Tim Cox paints the cowboy life he lives everyday. 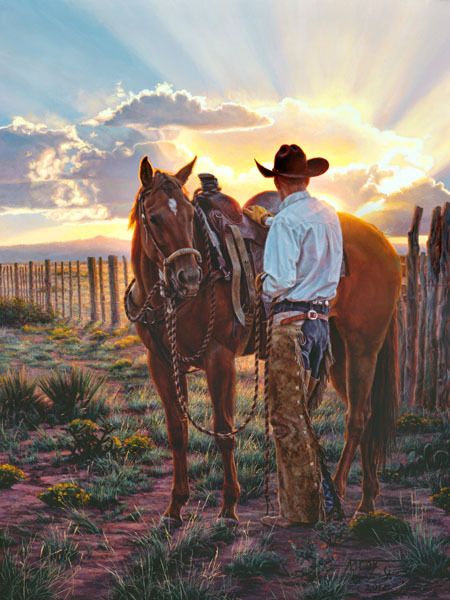 From chores around the ranch to riding the range, the artist depicts all aspects of the cowboy's heritage. With a beautiful sky above the vast plains and a view into eternity, this cowboy pauses to enjoy the splendor before him and knows it doesn't get any better than this in his world. As a young child, Tim Cox vowed he “was going to be a cowboy artist” when he grew up, and he has lived that dream for 30 years. Growing up in a small farming and ranching community in Arizona was a natural environment that influenced Cox’s love for being surrounded by cattle and horses and the wide open spaces. While most of the artist’s time is spent painting, he rides and works on various ranches throughout the West and also raises cattle and trains horses he owns. Cox’s everyday experience with the cowboy life is reflected in the outstanding works that he creates. He combines color, value, perspective, accuracy, and design in his scenes of the daily life of the cowboy. As a perfectionist, his attention to detail and hands-on knowledge of the cattle and horses he so loves to paint have earned the artist legends of admirers and collectors who appreciate his accurate portrayals of western life. Viewers are brought up-close and personal with the animals and people who inhabit Cox’s world. The West comes alive in his paintings. Considered one of the great western artists of our time, Cox is one of today’s most successful painters in his genre. Through the years, many accolades have been bestowed on this very talented artist, and this year Cox was asked to join the prestigious Cowboy Artists of America; he participated in the 2008 exhibition. Cox has won numerous awards for his wonderful art. In 2008, Décor magazine featured Cox as one of the 14 Most Enduring and Successful Poster Artists. In 2007, his painting, “Good Horses and Wide Open Spaces,” won the Express Ranches Great American Cowboy Award; at this same exhibit in 2004, “Along Eagle Creek” won the award. In 2003, the artist was honored with one of the most prestigious awards in western art at the National Cowboy and Western Heritage Museum exhibit. Cox’s painting, “On to Better Pastures,” won the coveted Prix de West Purchase Award. In 2001, the artist was awarded the Will Rogers Western Artist of the Year by the Academy of Western Artists and Friends of Western Art. Cox is also a three-time winner of the Olaf Wieghorst Best of Show at The Mountain Oyster Club. Tim, a fourth generation Arizonan, and his wife, Suzie, enjoy the life that the artist paints on their ranch in New Mexico that they call home. Surrounded by their cattle and horses, they truly live the western life that most of us can only dream about. Come ride the open range with Cox and experience the West as only he can paint it.